I was chewing on the famous line and the bite kept growing on me, filling my mouth with a bitter taste. Finally I swallowed it down, deciding that it didn’t refer to me. I may have some hobbies, preferences and habits that are different to what you expect from a 45 year old, but I’ve never obsessed over my wrinkles or hair colour. I carry the inevitable breakdown of my body with equanimity. But even if I shrugged away that nagging quote, I still felt rather sad after I had watched Sunset Boulevard at my local film club. It exposed the dark side of the machinery of Hollywood, the cynicism that grows from it and the inevitability that everyone who enters this wold at one point will be spit out and thrown away when it’s been decided that they’re too old. And this moment will come a lot earlier in your life if you’re a female actor than if you’re a male. It made me even more depressed to think about how up-to-date this film is, more than 60 years after it was made. My initial reaction had been to think: why couldn’t they make it the reverse? Make it about a man who clings to dreams of his glorious past and who in vain pursuits the love from a younger woman. But then I realized that the movie isn’t showing the world as it should be. It just holds up a mirror to let us see the ugly truth, the way the system works. 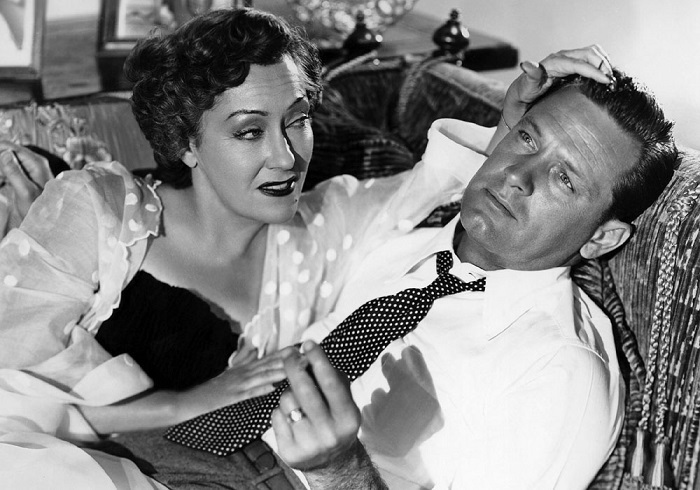 All it takes to see its relevance today is to throw a glance at the tabloid press and you’ll see dozes of articles about current actors who expose themselves to treatments that are more brutal and far reaching than the ones that the former silent movie star Norma Desmond submits to during the movie. Like her, they fight their wrinkles fiercely to keep themselves employable, prolonging their time on the screen. And they’ll do anything to keep their real age a secret, including suing IMDb for displaying it. So little has happened since Sunset Boulevard opened. Youth is still worshipped in Hollywood and the rest of the world. A love affair between an older woman and a younger man is still frowned upon (while the opposite, an older man dating a younger woman is perfectly acceptable.) It brings down my mood to think about it. And yet, for all of this darkness, I cherished every second of the movie. While it is a tragedy at core, it’s got a lot of humour in it too. And the writing! Don’t get me started on it. It’s far from the natural, improvised style that I enjoy in modern movies, but I enjoy it for what it is: a show number by someone who knows how to dance with words. There are so many great lines in it that it ends up to several pages at IMDb of memorable quotes.